SPARE ROOM presents Psychic Properties, a solo exhibition by Josh Gabert-Doyon. The exhibition is a typological investigation into speculative real estate, documenting the building facades of various commercial psychics, mediums, and fortune tellers across Vancouver. 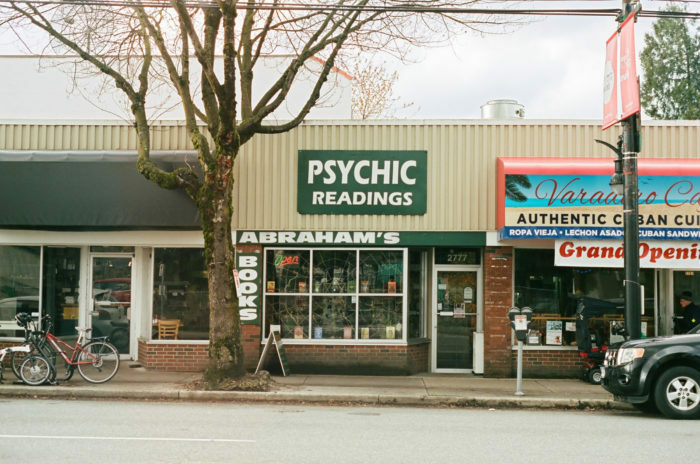 The project makes use of chronically unreliable business listings to map Vancouver’s clairvoyants. Subject to the fluctuations of a speculative real estate market, these establishments often operate in precarious tenancy situations; Gabert-Doyon’s incomplete documentation project is an inquiry into how these establishments both indexed and predicted displacement and neighbourhood change. In architectural terms, the facade has conventionally been understood as dramatizing the relationship between the exterior and interior space of a building, offering access to the structure’s inner character or essential value. A structure’s facade typically speaks to its historicity while emphasizing an optical flatness. The photos in Psychic Properties, rear projected with the aid of a boxed container structure, consider the significance of the facade and its relationship to real estate marketing. Josh Gabert-Doyon is a writer and photographer based in Vancouver. His work attempts to negotiate the space between archival, journalistic, and narrative practices.